Captain John Michael Estocin was born on April 27, 1931, at Turtle Creek, Pennsylvania, and a graduate of State Teachers College at Slippery Rock, Pennsylvania, he entered naval service as an aviation cadet in June 1954. A Lieutenant Commander at the time, he was listed as "missing in action and presumed captured." He was subsequently promoted to Commander and then Captain before his status was changed on November 10, 1977, to "killed in action". Captain Michael John Estocin, USN, was posthumously awarded the Congressional Medal of Honor, Distinguished Flying Cross, Navy Commendation Medal and Air Medal (first through twelfth strike/flight awards). For conspicuous gallantry and intrepidity at the risk of his life above and beyond the call of duty on 20 and 26 April 1967 as a pilot in Attack Squadron 192, embarked in USS TICONDEROGA (CVA 14). Leading a 3-plane group of aircraft in support of a coordinated strike against 2 thermal power plants in Haiphong, North Vietnam, on 20 April 1967, Capt. Estocin provided continuous warnings to the strike group leaders of the surface-to air missile (SAM) threats, and personally neutralized 3 SAM sites. Although his aircraft was severely damaged by an exploding missile, he re-entered the target area and relentlessly prosecuted a SHRIKE attack in the face of intense antiaircraft fire. With less than 5 minutes of fuel remaining he departed the target area and commenced inflight refueling which continued for over 100 miles. 3 miles aft of TICONDEROGA, and without enough fuel for a second approach, he disengaged from the tanker and executed a precise approach to a fiery arrested landing. On 26 April 1967, in support of a coordinated strike against the vital fuel facilities in Haiphong, he led an attack on a threatening SAM site, during which his aircraft was seriously damaged by an exploding SAM; nevertheless, he regained control of his burning aircraft and courageously launched his SHRIKE missiles before departing the area. By his inspiring courage and unswerving devotion to duty in the face of grave personal danger, Captain Estocin upheld the highest traditions of the U.S. Naval Service. After her commissioning, ESTOCIN was assigned to Destroyer Squadron Eight, homeported in Mayport, FL. While there, she made deployments to the Mediterranean, the Indian Ocean, and participated in Special Operations off the Central American coast. Throughout 1986, ESTOCIN served as the Navy's testbed for the Mk-92 Fire Control System improvement project (CORT). The Mk-92 "CORT" program was a CNO Priority-1 Project, one of the only four in the entire Navy at that time. These tests had ESTOCIN tracking and engaging a variety of surface and air targets. Fifteen SM-1 medium range missiles and nearly 1000 rounds of 76mm ammunition were fired in the course of the test cycle. By the end of 1986, ESTOCIN had logged nearly 15,000 underway miles in support of this project. On October 1, 1986, ESTOCIN officially became part of the Naval Reserve Force (NRF) reported to Naval Surface Warfare Group Four, homeported in Philadelphia, PA. Upon joining the NRF, ESTOCIN operated primarily in the western Atlantic in support of Naval Reserve Training (NRT) and active fleet commitments. She logged frequent underway weekends devoted entirely to Selected Reserve crew training, as well as periodic underway periods of 2 week duration to enable reservists to complete their active duty training requirements. These operations took ESTOCIN as far north as Nova Scotia and south to the Caribbean. 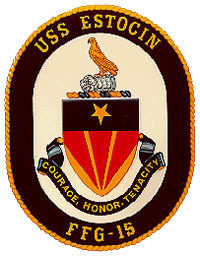 ESTOCIN was chosen to conduct a Great Lakes Cruise in 1991 in support of U.S. Navy recruiting efforts and to promote public awareness in America's heartland, through port calls to U.S. and Canadian cities on the Great Lakes. In the fall of 1991 and the spring of 1992, ESTOCIN participated in Canadian Fleet Operations conducted with U.S. Navy and Canadian Maritime Command units in the area south of Nova Scotia. On August 17, 1992, ESTOCIN changed homeport to Newport, RI. ESTOCIN completed Maritime Interdiction Operations in the Caribbean and in December of 1993 operated off the coast of Haiti during Operation Support Democracy. In January of 1994, ESTOCIN again changed her homeport moving to Naval Base, Norfolk, VA. ESTOCIN was again selected for a Great Lakes Cruise in the summer of 1994. Upon completion of this cruise, she underwent a four month drydock period to inspect and overhaul numerous shipboard systems. After completion of this drydocking, ESTOCIN was sent in the fall of 1995 to the Caribbean in support of Counter Drug Operations. During this cruise, ESTOCIN transited the Panama Canal to conduct Counter Drug Operations in the eastern Pacific as well. In 1996, after completing a work-up cycle, which included recertification of her propulsion plant and cruise missile tactical qualification, ESTOCIN deployed with Destroyer Squadron Eighteen in support of Operation Northern Light-Bright Horizon 96. During this fast paced month and a half commitment, ESTOCIN participated in a variety of maneuvering and training exercises with over 53 ships and submarines from 13 European nations. Upon her return to Norfolk, ESTOCIN entered an availability period to prepare ship's systems for her next commitment, Joint Task Force Exercise 97-1 (JTFEX 97-1). During this exercise ESTOCIN was the flagship for the Opposing Forces (OPFOR), whose mission was to train the deploying carrier battle group. Although composed of U.S. ships, the OPFOR simulated a variety of patrol boats found throughout the world. Successfully training the battle group, ESTOCIN prepared for her next deployment. Assigned to Cruiser Destroyer Group Eight, ESTOCIN deployed for Baltic Operations 97 (BALTOPS 97) in May of 1997. The deployment entailed at-sea operations with ships from NATO countries as well as non-NATO countries such as Russia, Poland and Lithuania. BALTOPS 97 also included goodwill visits to former Eastern-Bloc nations. During this deployment, ESTOCIN had the unique opportunity to become the first U.S. warship to visit two Russian ports in the same deployment, with stops in Baltiysk and Severomorsk, Russia. In addition, ESTOCIN had the distinct privilege of hosting the Admirals of the Russian Baltic and Northern Fleets during her port calls. January of 1999 found ESTOCIN deploying for the Caribbean. Once again in support of Counter Drug Operations, ESTOCIN set the standard in curbing the flow of drugs into the United States. After four and a half months in the Caribbean, including a cocaine seizure of over 400 kgs, ESTOCIN returned home on May 15. ESTOCIN was underway once again at the end of June 1999 to participate in INDEX 99-2 with the John F Kennedy Battle Group. During this exercise, ESTOCIN simulated Opposing Forces during Harpoon, Anti Air Warfare, and Anti Submarine Warfare exercises. ESTOCIN proved her battle readiness in all areas as she conducted multiple PACFIRES with her 76mm gun, launched two Mk 46 Torpedoes and fired three successful SM-1 engagements. After achieving her best battle readiness condition in over four years, ESTOCIN returned to Norfolk in July to conduct a nine week Restricted Availability (RAV). 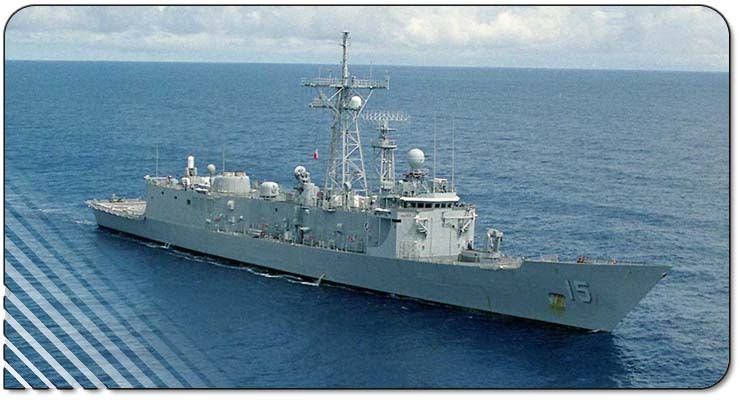 After this maintenance period and successful training cycle workups, ESTOCIN sailed late November 1999 to support preparing the EISENHOWER Battle Group for deployment as an Opposition Force in JTFEX 00-1. She also participated in INDEX 99-3, which allowed training in all warfare areas for the crew. At the completion of the JTFEX, ESTOCIN was chosen by Commander, Second Fleet to perform a bilateral exercise with two French Navy ships, the FS JEANNE D’ARC and FS GEORGES LEYGUES. This exercise provided valuable training for the midshipmen embarked on JEANNE D’ARC and helped to further strengthen the strong Naval ties with this NATO ally.